The new C37.94-to-T1 FSU is designed to convert any application devices with standard IEEE C37.94 compliant Short-Haul Fiber signals to an electrical T1 signal. The C37.94-to-T1 FSU is the perfect cost-effective solution to transport any industrial application devices reliably over an existing communications network, DS-1 Line or Leased T1 service. The unit also comes with a non-standard Single-mode LED as an option for longer distances. 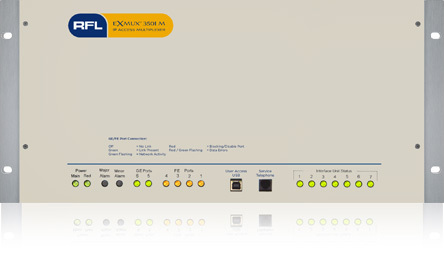 The RFL™ EXMUX® 3501 is a substation-hardened IP Access Multiplexer engineered for mission critical infrastructures. • The RFL™ 9745 Audio Tone Teleprotection system is expected to no longer be available for purchase as of August 1, 2019. For additional details, please reference Bulletin PO-019.